When Diane first reached out to us to discuss her project, she faced a major transition. She was living in a sleek, urban condo that overlooked the Nashville skyline. And she was packing her bags to come live in her daughter’s suburban Knoxville basement. Before we met in person, Diane sent us a photograph of herself sitting on a designer sofa, beneath a pile of smiling grandchildren. She wanted to be close to them in Knoxville and wanted to bring her big city style along with her. Diane described her style as, “minimalist meets eclectic mixed with mid-century topped with some whimsy.” How could we refuse? She hired us to design a basement transformation that came to be known as the Grannypad. To be fair to Diane’s daughter, this basement was hardly the damp, dark space we often picture. With tall windows, french doors, and its own patio, the space was very adaptable to Diane’s big plans. The new home had been built recently in a traditional style. Compared to our usual clientele with their 100-year-old houses, the rooms were large and generous. But dining, living, and kitchen areas were separate with very little visual connection. We wanted to maintain some walls and private space for the bedroom, bathroom, and storage areas. But the “public” spaces (living, dining, kitchen, and craft rooms) were to be open and connected. Even open-concept needs a few walls. One of the most common characteristics of modern design is the open plan concept. People often hold the mistaken belief that an open plan means you need to get rid of most of your walls. Not so! The feeling of an open plan happens when you size your openings (doors and doorways) properly and align them intentionally. Did you catch that? That’s our secret sauce when it comes to modernizing old houses – create flow and connection by aligning openings rather than tearing out all of the beautiful plaster, trim, and moldings that make an old house feel…old. This house was new, but the same strategy worked wonders. 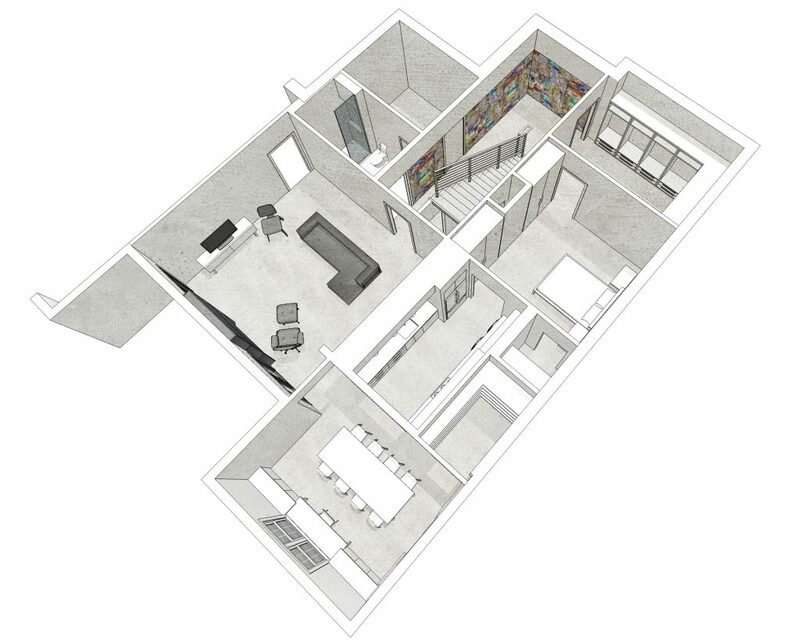 We proposed a kitchen with an open seating area and unobstructed views to the living space. The traditional treatment of the fireplace had to go. 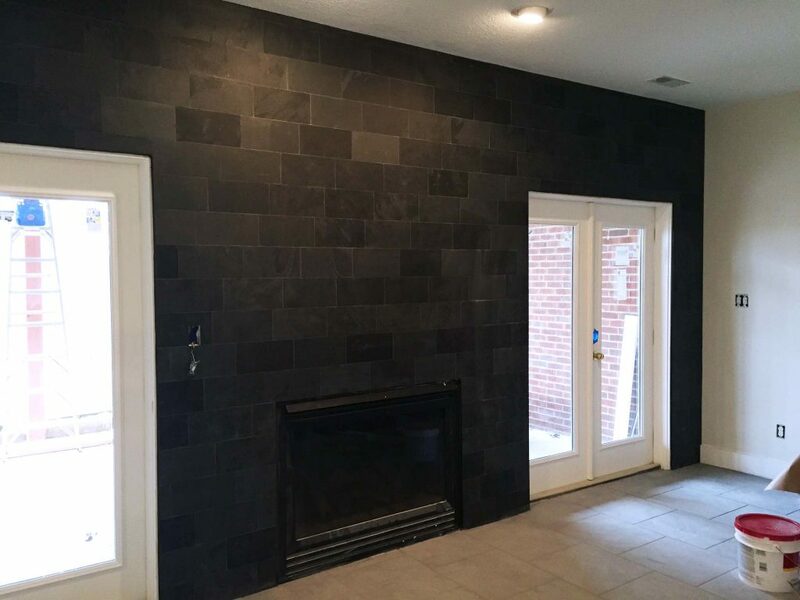 Diane opted instead for an accent wall of slate tile. The natural stone preserves the visual weight and materiality of a chimney and is more minimal than a mantelpiece and hearth. Diane’s puzzle collection found a home behind her television where the pop of color provides a nice accent. She also had an impressive collection of Toby mugs that found a place in the new Grannypad. Our pleasure, Diane! Thanks for inviting us to be a part of it. Love the renovation concept. Only you two could do that! Can’t wait to see photos! Thanks, Cammy! We’re excited to get them! Should be a week or two from now. Hope you’re well!